If you want comfortable men's shoes that will keep your feet dry in wet weather, get a pair of these Danner Men's 45003 Brown Pronghorn Waterproof 8 Inch Waterproof Boots. 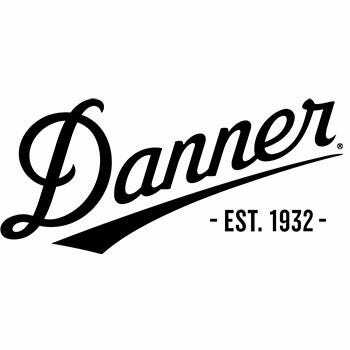 Bringing back their popular CamoHide leather and the proven TERRA FORCE technology, Danner ha ... (see full details) (see specifications) #DNN45003. If you want comfortable men's shoes that will keep your feet dry in wet weather, get a pair of these Danner Men's 45003 Brown Pronghorn Waterproof 8 Inch Waterproof Boots. Bringing back their popular CamoHide leather and the proven TERRA FORCE technology, Danner has updated the design of this Pronghorn footwear for a more streamlined and lightweight profile. New lasts and opened toe boxes were utilized to create wider platforms for you, and a better fit. The uppers of these premium boots are manufactured with a combination of waterproof full-grain CamoHide leather and rugged, lightweight 1000 Denier nylon panels for strength and durability. Used primarily in waterproof boots designed for extended trips, heavy loads, and hard terrain, full-grain leather is extremely water-resistant, durable, and supportive. It can absorb up to 30% of its weight in water vapor without loss of dryness. In addition, the CamoHide leather of these brown shoes is treated for scuff-resistance and the pattern is dyed all the way through to prevent fading. To keep your feet even drier, this exceptional footwear features waterproof, breathable GORE-TEX lining. These membranes let moisture vapor out, but don't allow water to get inside these men's shoes. The wafer-thin membranes are made up of billions of tiny pores, allowing perspiration to escape, but are too small for liquid water to penetrate. As a result, your feet will stay dry, warm, and comfortable throughout the entire day. In addition all-leather toe and heel caps resist abrasions, scuffs, and scrapes for added durability. Protecting the backs and forefoot parts of these work boots from rocks, these rugged caps will help to prevent splitting of the material and increase the life of the leather footwear. Ortholite footbeds with triple layer cushioning offer optimal airflow and improved comfort while you work wearing these boots. OrthoLite is an open-cell polyurethane base foam which enables air circulation through and around the insole to create a cooler environment. This foam offers up to 95-100% breathability, providing maximum ventilation in and around your feet to keep you more comfortable when you get hot. Lightweight and shock-absorbing, polyurethane also provides maximum protection from impact. These shoes also feature TERRA FORCE technology, providing exceptional support and stability with amazingly light weight. The four components in this exclusive system combine to form an extremely rigid, stable platform that's also comfortable and supportive. To provide the added stability of a slightly wider platform, the uppers are stitched through the insole plates in the heels and forefoot areas. Internal shanks work with the insole plates to create firm foundations, protecting your arches from overwork and fatigue. Next, the polyurethane midsoles of this work footwear provides lightweight cushioning with every step you take. Finally, visible external nylon shanks offer exceptional lateral and medial stability. On the bottom, the Danner Pronghorn outsoles provide solid traction over rugged terrain. These new outsoles retain all the performance of previous generations with a combination of rubber compounds that perform in slick mud and rugged underbrush. Rubber has superior slip-, puncture-, and cut-resistance compared to PVC. The material of the slip-resistant footwear is also very durable and will resist bases, acids, alcohols, and diluted water solutions of most chemicals that are water soluble. In addition, rubber has excellent low temperature properties, which allow the material to stay supple in cold temperatures. Rugged hardware provides a secure fit and long-lasting performance to see you through those long hours of work. The next time you step out for work, lace up a pair of these Danner Men's 45003 Brown Pronghorn Waterproof 8 Inch Chemical-Resistant Boots. You can click on the cart button to place your order today! Danner has been around a long time and for good reason. They make a quality boot. Top grade leather goes into every pair. So does craftsmanship and if you own a pair you know what I'm talking about. Very comfortable boot. Didn't even need any insoles. Great traction. The laces won't last long though. Would have given 5 stars if they had Iron Laces in them. No one likes breaking laces because its not like there's a covenant time to. But I still highly recommend these boots. Danner Boots: Men's Waterproof 45003 Brown Pronghorn Leather Work Boots is being added to your cart.